First impressions count so it's important to put your most stunning smile forward; you can never be too prepared for that next date, job interview or even the perfect selfie before that big party. 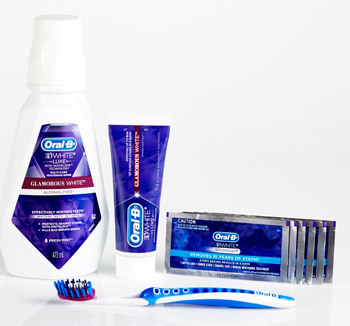 Oral-B is set to bring the next advancement in teeth whitening to Australia with the latest additions to its 3D White collection – a new toothpaste and whitening booster kit, including a new brush and three days' worth of whitestrips. Combining micro-cleansing teeth whiteners and a refreshing foaming action, the 3D White LUXE Glamorous White Toothpaste helps to freshen breath and promises a visibly shinier smile in just one day. Its unique Whitelock Technology fills in the micro-lines of the enamel to create a smooth surface for a shining bright smile. Indulgences like your morning coffee and red wine can create surface stains over time. By using the 3D White LUXE Glamorous White Toothpaste you can remove up to 90% of surface stains in just five days so you don't have to give up life's simple pleasures. Leading Australian dentist Dr. Christopher Ho comments: 'A shiny white smile is always on trend, but I find that people become increasingly interested before major events like a wedding, formal or an important date. With its Whitelock Technology, the Oral-B 3D White LUXE collection is a smart and convenient at-home solution for those who want to achieve a noticeably shinier smile in between dental visits and just in time for that special occasion." The 3D White LUXE Booster Kit containing the new 3D White LUXE Pro-Flex Toothbrush and six 3D White Whitestrips is the perfect way to sample the revolutionary technology for first time users of at-home whitening products. The Pro-Flex Toothbrush has two vertical moving Pro-Flex sides which individually adjust to the unique contours of your teeth and gums to allow cleaning all the way to the gum line, a soft rubber stain eraser to help whiten and polish your teeth, and criss-cross bristles which work together with the Power Tip to clean hard-to-reach areas. Oral-B's innovative 3D White Whitestrips are thin, flexible strips that conform to the shape of your teeth and are coated with a tooth whitening gel containing hydrogen peroxide. They work by holding the whitening gel to your teeth and, when used for 30 minutes twice a day, effectively whiten teeth and remove years of stains. For best results, the 3D White LUXE products should be used as part of the overall Oral-B 3D White range already available at all leading supermarkets and pharmacies.